Have you ever had someone ask you to pray about something with which they are struggling? Or, maybe they are just always talking about the same problem in their life. It is like they never move on or learn. They are stuck; stuck in sin. Maybe that someone is a kid. As a parent you try and teach kids to do the right thing. When they make a mistake you want them to learn from it and move on and not repeat it. If they come to tell you of a mistake hoping you will be so proud of their admitting it do you forgo the consequences? Wonder where they get such an idea? Have you ever approached God that way? Mistakes happen. When we keep repeating them they are no longer mistakes. With few exceptions, our mistakes are sin. Sin has consequences. Without them you could sin every Saturday and repent every Sunday. I have known people like that; once is a mistake, twice a habit and then a lifestyle. They make a show every Sunday but, come Monday they’re back in the rut. 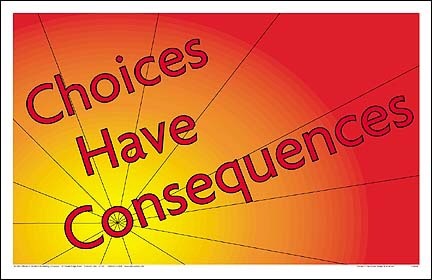 reminded by consequences why we turned from them. If The Lord shows us an area in our life we need to turn from and we repent, we can lean on His power to not return to that sin. If His grace erases consequences too, you are truces blessed. If not, accept what consequences there are and grow. This entry was posted in Mom2Mom and tagged forgiveness, penalties, repent, teuth or consequences. Bookmark the permalink.